Rather than taking their pets to be professionally groomed, many dog owners are now deciding to do the job themselves. But if you are going to take on this task, you need to ensure that you have all the right equipment to do so. One of the most useful tools is a set of dog thinning shears – particularly for those pooches with thicker and shaggier coats. To aid you in your task of choosing the right set for your hound, we have selected 10 of the best dog thinning shears on the market to cast our eyes over, as well as giving you more detailed information about each of them. Ready to trim your giant furball back to normal? Then let’s get started! Leading our list is this set of grooming scissors from Pet Magasin. 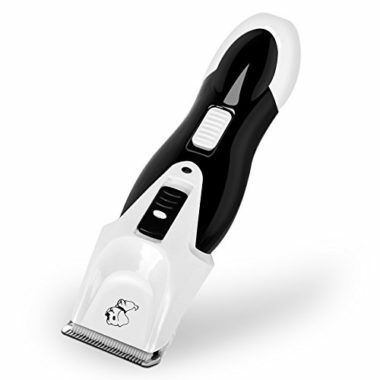 The longer of the two has smoother blades, ideal for trimming body fur. As for the shorter, it features micro-serrated blades to use around the face, ear, and paw areas. The rounded tips at the top ensure that you will not painfully poke your pet while grooming them. 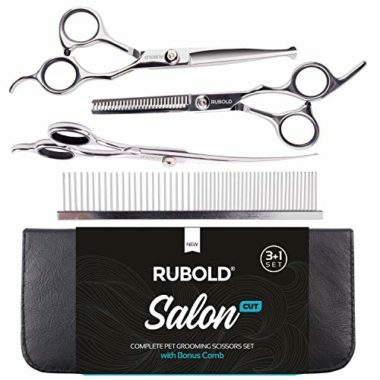 The quality of the blade material is always important when choosing grooming scissors, and this set has surgical quality stainless-steel blades. As for the handles, they are cushioned for your comfort, and there is an extra finger rest for increased comfort. If your dog is starting to look a little too shaggy, these round-tip shears are ideal for thinning out their coat and making adjustments. Made from Japanese stainless steel, the blades are micro-serrated for a high level of effectiveness. Lightweight and comfortable to use, the finger holes are soft-grip and there is a rest to help stop your hand from cramping up. At the end are rounded tips for added safety. When you aren’t worried about poking your dog, you feel much freer to do the grooming work easily. If you want to groom your dog to a professional standard, these thinning shears make the perfect addition to your collection. 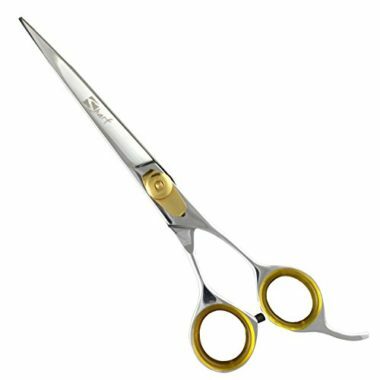 The Japanese stainless-steel which the shears are made from is top-quality, ensuring a high level of sharpness. Both stylish and comfortable, the gold, rubber rings offer you plenty of grip to keep maximum control over the shears for extended grooming sessions. Each and every set comes with a snap close case for ease of storage and protection. When you are grooming your dog, making sure that they stay safe is one of your most important responsibilities. This lightweight set of thinning scissors is ball-tipped to ensure that you won’t painfully poke your pet. You can even trim around tough areas such as their nose, face, ears, and paws with ease. The padded handle comes in a range of different colors depending on your preference. Operation is quiet, so you are less likely to startle your dog while using the scissors. Scaredy Cat are so confident in their scissors that they offer a lifetime replacement guarantee in case anything should go wrong with them. Looking for a kit which includes everything you need to groom your furry friend? Well, this one includes four different items: straight scissors, curved scissors, thinning shears, and a trimming comb. All are made of stainless-steel and titanium coated for toughness without rusting. Everything comes in a zippered storage case. As for the handles, they are contoured and feature finger rests to offer maximum comfort. There is also a silicone pad in the middle which stops you from clamping your fingers and reduces the sound to make it less likely your pet will get scared. If you need to tighten the blades or sharpen them up, you can simply adjust the screw. 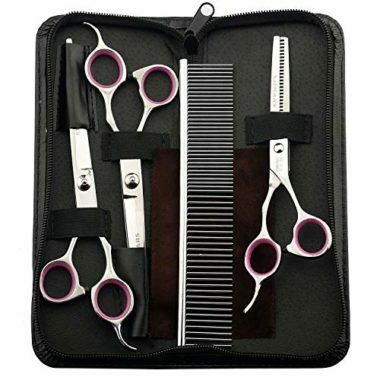 Another total grooming kit, this one includes straight and curved scissors, grooming shears, a grooming comb, cleaning cloth, and a stylish black case. All the stainless-steel blades are razor sharp, and you can adjust the screws if you want to change the tightness. 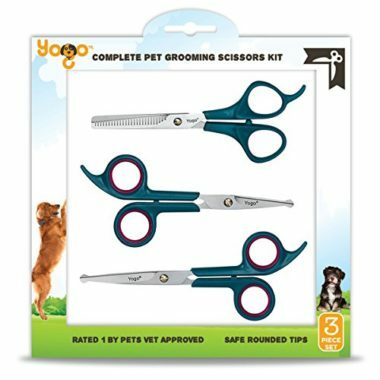 All of the tips of the dog grooming scissors are rounded to ensure that will not hurt your pet during your next pampering session. Each one is designed ergonomically with non-slip cushioned finger holes and an extra rest as well. Whether you are using these professionally or at home, both choices are highly viable options. This set of three scissors all come with rounded tips to prevent nicks and cuts. But the blades themselves are still sharp enough to comfortably cut through your pet’s coat. Inside the handle, there is an additional grip, and also a finger rest to support long grooming sessions. The stainless-steel blades have been coated with an anti-corrosion formula to keep them working longer without rusting. 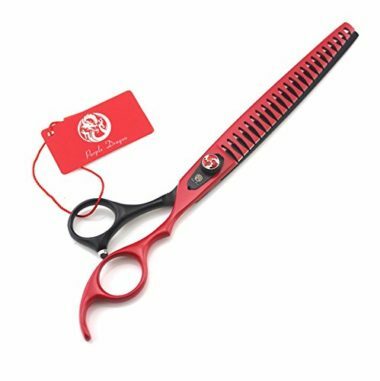 The thinning shears are suitable for pets with coats of all varieties, and all the scissors have been extensively tested for effectiveness. Japanese high hardness stainless-steel has been used in all of the products in this set. All offer sharpness and strength to make short work of your dog’s coat, so you can continue grooming your pooch for many years to come. Everything has been ergonomically designed to ensure that it is nice and comfortable to use. There is a rubber ring on each of the finger holes, which you can remove if it is more comfortable. You can keep everything in the stylish case, which has a special area for each one of the tools. This set of professional grooming scissors is made from 440C Grade stainless steel with a durable and strong construction. The blades are both sharp and smooth, making it easy to cut at angles of 45 degrees. The silencer design helps to ensure that your dog will not get startled by a loud cutting noise. The design is ergonomically curved to ensure minimal risk of repetitive motion injury. It is suitable for professional pet groomers and home users alike. 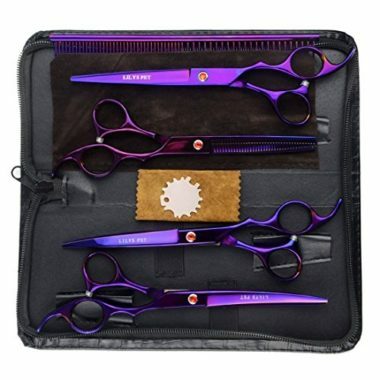 Made in a striking purple color, this kit includes everything you need for the grooming of your dog including three sets of scissors, dog shears, and a comb. Everything has been constructed using stainless-steel and coated in titanium to ensure that it is going to last for many years to come. The ergonomic design makes the task of grooming easier and makes it less likely that you will suffer from a repetitive strain injury. There are a range of different things which you need to consider before buying thinning shears for dogs. Here are a few of the top points to bear in mind. The type and length of your dog’s coat is bound to make a big difference when it comes to which dog grooming shears you should choose. For finer or thinner coats, smaller scissors ranging between 5.5 to 6.5 inches are entirely appropriate as these will give you more control without causing strain in your hands. In terms of the style, shears with one straight edge and one edge with teeth tend to work well. However, if your dog has a thicker and shaggier coat, it is worth going for a set between 7.5 and 8.5 inches as these will allow you to get through their fur much quicker, leaving them with a nice smooth and stylish finish. The style of two blades with teeth will increase the efficiency of the job in hand. The way you intend to groom your dog will also have an impact on your decision making. Ultimately, this comes down to whether you want to give your dog regular grooming sessions, or you just want to touch them up from time to time. If you are just looking to give them lighter trims around their face, ears, or feet, a shorter and more curved pair will allow you to get into tighter areas. Medium-standard shears are ideal for general maintenance. But if you are serious about grooming your pooch on a regular basis, it makes sense that you go for some professional-standard shears. Obviously, the last thing that you want is to put your dog’s safety at risk, so you should look for protective features. For example, shears with a rounded tip will reduce the risk of poking your pooch with the sharp end. If you do choose straight shears, you will have to take more care and attention when you are grooming your furry friend. The materials used to make the scissors is a good indication of quality. Ideally, you should be looking for stainless-steel as this is tough, durable, and likely to stand the test of time. Also, it is more likely to retain sharpness, which makes it less likely that you will tug on their coat during the grooming process. Don’t forget that the shears need regular maintenance to stay in peak condition. This means cleaning and oiling them on a regular basis. Your dog’s comfort isn’t the only point to consider; you also have to think about your own as well. Look for an ergonomic handle, which allows you to grip it for longer without feeling tired. Comfort rubber grips can help this process to go more smoothly. Other possible features include a thumb hole or finger rest, which are useful additions if you are going to be using the scissors for a sustained period of time. Some of the issues which can arise from the wrong set of dog shears include carpal tunnel syndrome, tendonitis, and cramp. Another point to consider regarding comfort is that the weight is comfortable, so you don’t feel like you are weighed down while using them. Some of the products which we have listed above are entire grooming kits which also come with additional items such as more scissors, combs, cloths and cases. If you plan on doing your dog’s grooming sessions yourself and haven’t got any equipment yet, these kits make a nice and affordable choice. Before you buy a product, it is always worth knowing more about what sort of satisfaction guarantees and warranties the brand offers. Many of the products listed in our guide have a satisfaction guarantee of at least a year, meaning that you can return the shears at any time during this period if you are not entirely happy. Further to this, some brands also offer lifetime warranties, which guarantee a replacement of the product is it happens to break for any reason. There are plenty of reasons why dog grooming shears are such a worthwhile product. Let’s look at a few of these in more detail here and now. First up, grooming shears are a useful tool in ensuring that your dog’s coat stays in the best condition. If they get too shaggy, it is more likely that knots will develop, which are uncomfortable. If you maintain your dog’s coat regularly, it is much less of an effort in each and every grooming session. By removing loose hair, you are also promoting a shiny coat as you make it easier for dirt to slide off it. 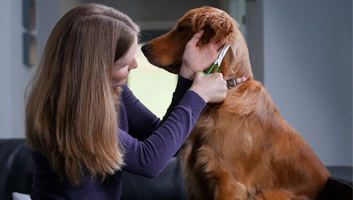 Grooming your dog on a regular basis is one of the cornerstones of keeping them healthy. By removing knots, dirt, and debris from their coat, you help to clear it of bacteria, fungi, and other pathogens, which could lead to infection. It also gives you the opportunity to check their face and body for early signs of health issues. Shears vs Scissors: Is There Any Difference? There are several main differences between scissors and shears. Of course, both often form an essential part of your dog grooming kit, but it is useful to know about some of the main differences between the two. Scissors tend to be more symmetrical in their appearance as both of the finger holes are the same size as opposed to shears which have one hole larger than the other. The blade length is another quality which sets these two pieces of equipment apart. 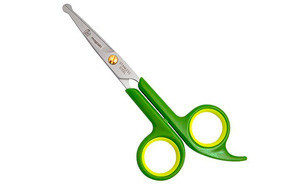 Shears tend to have blades longer than six inches, whereas scissors are often shorter than this. One of the main confusing points is that people often use these two terms interchangeably, but there are some clear distinctions out there. 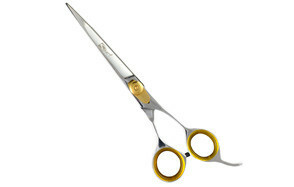 As for the edges, shears have two different varieties: bevelled and convex. These ones have small serrations which aid in keeping the hair in position without moving it forward. They are best-suited to dogs with fine, soft coats. As for convex edges, these tend to offer a smoother cutting experience. They are great for cutting through denser coats, but they tend to be at the more expensive end of the scale. In terms of similarities, both usually use steel or stainless-steel on the blades. This is a hardened combination of iron and carbon, and it is usually coated in a substance which is designed to prevent rust. No matter which variety you choose, you should be looking for quality. Both require regular maintenance as dull or weak blades can end up resulting in more split ends and uneven coats. Always keep the blades properly lubricated and stored in a safe environment. All grooming shears are different, so it is important that you choose a set which properly does the job that you are looking to achieve. If you are grooming different types of dog, you may well need several sets of shears depending on their coat length and style. The first variety that we are going to talk about is a pair of shears with a bevelled edge. These work well for a wide variety of breeds and different sizes of dog. They are well-known for their ability to cut right from the pivot to the very top. Also, they tend to have more of a space between the blades. This means that you can slice through hair quicker, so thinning out a particularly thick coat becomes a cinch. Your other main option is a straight-edged pair of shears. These are best suited to the more delicate and careful areas of grooming around your dog’s body including their paws, face, ears, and tail. Also, if your pooch is especially knotted, they are also handy in getting rid of these stubborn clumps of fur. Be careful not to use the wrong type of shears as this can injure your dog and make it more likely that you are going to damage your equipment too. Finally, you have the rounded and specialized grooming shears. If you have a dog with a curly coat like a poodle, these are useful. Since they are designed for detailed work, they are especially used amongst professional groomers. Q: What are fur thinning shears? A: Fur thinning shears look are designed to cut out hairs from a larger bunch in your dog’s coat. This helps to leave the coat lighter and thinner. They work in a similar way to thinning the thinning shears that a hairdresser would use on your own hair. From your dog’s point of view, this leaves them with less heavy, dead fur to carry around, so more air can circulate and reach their skin. This is especially beneficial during the warmer months of the year. From a style perspective, thinning out your dog’s coat helps to leave them looking their very best once again. Essentially, thinning shears form a key part of a grooming kit for your dog. Q: How should I care for my shears? 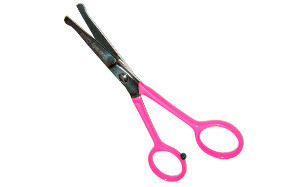 A: Looking after your shears is crucial in making sure that they maintain their long life. First, you should make sure that you clean them thoroughly after every single use. Remove all of the hair and fur which has got stuck around them. If fur is left too long, this can lead to rusting. If you have used any products such as hairspray, it is important that you wipe this off thoroughly. Make sure to dry the shears afterward. It is worth investing in some good-quality shear lube for your tools. Look for a product which is made from gentle solvent and silicone. As well as keeping the screws firmly in place, this also helps to prevent rust and grime from building up on the shears. After you have applied this product, take around 30 seconds to open and close the shears to get the lubricant spread around. When you are choosing a storage space, you should look for a place which is both cool and dry. Q: How do I use thinning shears? A: First, choose your grooming spot. For smaller dogs, this may be a table or counter space. For larger hounds, the floor is likely to be best. Ideally, it should be somewhere which is not slippery. You should start by laying out all the tools that you need during this grooming session. This will save you from having to stretch unnecessarily in the future. If you feel like you need to secure them in place, you can attach their leash and clip it to a point above their head. You will then need to brush or comb their hair gently to remove any mats or tangles. Now, you can start using the shears. The handle end should be close to your dog’s body and the tip should be angled away. Cut their hair slowly, starting from the paws up and going from front to back. 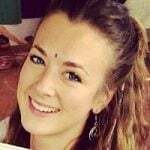 You should be cutting their hair rather than trying to rip it out of their skin. Keep checking to make sure everything lines up and the hairs are at the right length. Our top choice of grooming scissors is this set of two. One is larger for trimming body fur, while the smaller has micro-serrated blades for closer work. At the end are rounded tips for your pet’s safety. As for the material, it is surgical quality stainless-steel, which helps you in cutting through thick fur and tough tangles. This is a very highly-rated product and one which we rank at the top of our list.